Accurate and reasonably priced transcription services. We welcome any feedback, questions or comments about transcription services. 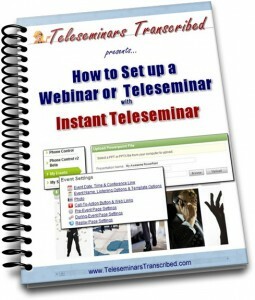 Instant Teleseminar is a service that allows you to set up webinars with telephone and online access for a monthly fee. This easy to use teleseminars service has some great features and this free guide will walk you through setting up your first event. To get started, you can sign up for the 21-day trial at Instant Teleseminar for just $1 (one dollar). ==> Click here to download this PDF to help you set up your event. Of course, when you are all done be sure to send your audio to TeleseminarsTranscribed.com to order transcripts of the event.